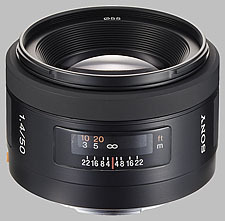 (From Sony lens literature) Enjoy the flexibility the Sony SAL-50F14 lens offers. Great for candid shots, this lens delivers stunning clarity even when the aperture is fully open. An ultra-bright standard lens for fast, accurate shooting by available light. For quick candid shots that capture "the decisive moment," this lens provides superb clarity and visual accuracy even with fully open aperture when working indoors or in low-light and twilight conditions. Mounted on the Sony a (alpha) DSLR-A100 camera, this lens provides midrange telephoto 75mm focal length (35mm equivalent) -- and takes advantage of the in-camera Super SteadyShot image stabilization system to minimize blur from shaky hands. Superb Sharpness in Available Light: In conjunction with the Super SteadyShot image stabilization system of the Sony a (alpha) DSLR-A100 camera, this lens achieve pinpoint sharpness even working with hand-held camera by available light. Bright f/1.4 Aperture: The ability to capture more light in dark environments gives you a superb lens for hand-held shooting without flash, to preserve the mood or in locations where flash is not permitted. Circular Aperture: Conventional lenses close their apertures with blades that can create multi-sided shapes -- but the aperture blades of this superb wide-angle lens form a near circle at the wide openings you'll use for low-light shots, so spot-light sources have a pleasing circular defocused effect. very good Image Quality. reasonable price. Excellent sharpness, light and small, color, 3D. Focusing ring not good for MF. This is a very nice small and light weight lens. Image quality is excellent by f/2.8 and it has typical Minolta colors and a lot of 3D too.